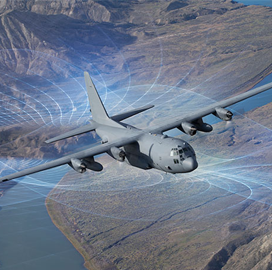 Raytheon has developed and tested electronic warfare tools intended to provide protection to U.S. Air Force vehicles. The platforms are designed to protect cargo aircraft, large body tankers and fighter jets and allow rapid configuration through the use of third-party technologies and open-source framework, the company said Thursday. “You need electronic attack and support to fly, fight and win," said Stefan Baur, vice president of electronic warfare systems at Raytheon. "That starts with now-term electronic warfare systems like advanced jammers and radar warning receivers that work with all of the other systems,” added Baur. The firm developed the Multi-Function Integrated Receiver-Exciter to accommodate digital payloads and adapt into any type or number of configurations. Raytheon created the Reactive Electronic Attack Measures and Electronic Support Critical Experiment programs to push efforts in the development of threat identification capabilities for EW systems.